Other: Hardly drinks. Married. Known as "the dreamer" at school. Likes buying clothes. Wrote The Tourist, the final track on OK Computer. Instruments: 'Mr Versatile'. Usually plays lead guitar or keyboard. 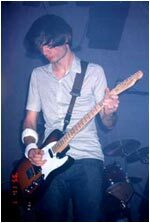 Jonny has to be the most talented, and original guitarist I've ever seen. Lead guitar isn't an easy role to fill in any kind of band. But in a band such as Radiohead, where you have 3 people who are all easily overqualified to fill the position of lead guitarist in almost any band, then you know the person who claims the position must be something special. Jonny is. In later albums, he's been making more subtle additions to the songs with different instruments, but from Pablo Honey to OK Computer, Jonny's guitar is the original and beautiful driving force behind the music. He wrote The Tourist and Last Flowers Till The Hospital. In later songs, his subtle strings and such give very atmospheric touches to the music without dominating them. There's no doubting that whatever he plays, he's an excellent musiscian. I do miss his guitar, though. Jonny is a shy person who doesn't enjoy interviews because he feels he comes across as an idiot. He's married, completely colourblind, and likes flying kites, buying records and crossword puzzles. He rewires his guitars to get some of the amazing sounds we hear on the songs, and likes to have as many instruments as possible in his corner of the stage. See Jonny's Page at Radiohead.com.